When most people envision a garden they imagine a large, open space filled with plants and shrubs. However, some gardeners find themselves with only a small amount of land to work with. If you have only a limited space to work with you can still turn it into a spectacular oasis and retreat from the outside world. Small gardens can greatly benefit from the strategic placement of a focal point. It is very important you look at your garden space with objectivity. 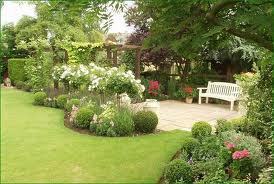 Your task is to locate the "sweet spot" in your garden area where you will install a focal point. What the focal point is really doesn't matter all that much, whatever fits into your design scheme is fine. The key is to find a balance between using an item that will draw positive attention but will not make everything else in your garden seem irrelevant. Make use of different sized containers in the garden area. It makes sense to distribute containers throughout a small space. Containers can easily add a height dimension to your garden and they are a perfect way to try out new plants without having to disrupt your other plantings. Using containers as a test bed for new plantings makes it very easy to dispose of them if they just don't work for one reason or another. The biggest benefit of containers, though, is that they allow you to do exactly what you want to do. Other options containers afford are the ability to provide special plants their own special soil and fertilizer to thrive and to move the containers around your garden area to create a new look at will. One school of thought for small gardens is to keep the number of plants to a minimum to create a spare and uncomplicated space. Personally, I don't agree with this thought at all. I believe in the theory that the more the better as long as they compliment each other. As I said earlier, using containers and even plants with different height will make your small garden look that much bigger because the eyes have more places to look. Installing plants that have different sized leaves and surface textures is also going to add a lot of visual interest to your small garden space. While it is important that your plants stand out from each other in certain ways, there is one very important detail that should be the same. Stick with just one color in your garden. Think about what colors you find calming and select one that you think would look good in your space. Pick plants that are available in different shades of that color. Putting a lot of different colors into a small garden can make it appear to be smaller than it actually is. Even if your small garden space looks drab and uninteresting at first glance there are obviously a lot of strategies at your disposal to turn your space into a beautiful oasis. Use the information in this article to help you construct a garden that will rival even the biggest competitors.